In case you hadn't heard, oil pulling is the popular practice of swishing oil (coconut oil seems to be the favorite) around in your mouth daily, in exchange for stuff like strange looks from your family members and various health benefits. You can see how the minutes would really start to drag, plus it's not a very efficient use of time - unless you multitask, which is why I'm here to help (sort of)! Here are 20 suggestions for productive things you can do to make those 20 minutes fly by. Answer the question, "Mommy, what's in your mouth?" 500 times, without opening your mouth. Vacuum glitter out of your daughter's backpack. Write an angry letter to CBS about the series finale of How I Met Your Mother. Answer the question, "Mommy, can I have some of what you're eating?" 500 times with the what-do-you-think? look. Remove the purple Hello Kitty nail polish your toddler used to give you a manicure yesterday. Turn 8,000 pairs of clean socks right-side-out. Answer the question, "Mommy, since you're busy, can I give the cat a bath?" with vigorous head shaking. Wonder if you just swallowed a bunch of oil. Search through your purse for a tissue that doesn't have gum wadded up in it. Clean behind the toilet - you're going to be gagging anyway, so you might as well do it now. Get rid of all the empty boxes of cereal someone put back into the cabinet. Daydream about a shirtless Zac Efron. Fold some of the laundry that's hanging off your treadmill. Delete Groupon emails (c'mon, let's face it - you're never going skydiving). Try not to think about all the toxins that, if this is really working, are currently swirling around in your mouth. 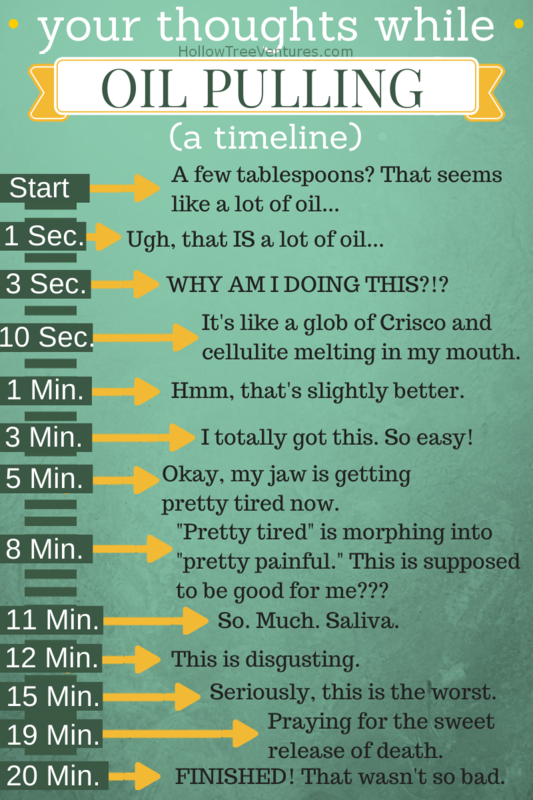 Google, "ways to get the benefits of oil pulling without actually oil pulling anymore, ever." Shop online for brown shirts to make your teeth look whiter, in case oil pulling doesn't really work. Check Pinterest for some low-fat, gluten-free, sugar-free, dairy-free recipes that'll use up the rest of this stupid coconut oil. Notice that, eventually, everyone was so grossed out by what you were doing that they left you alone. 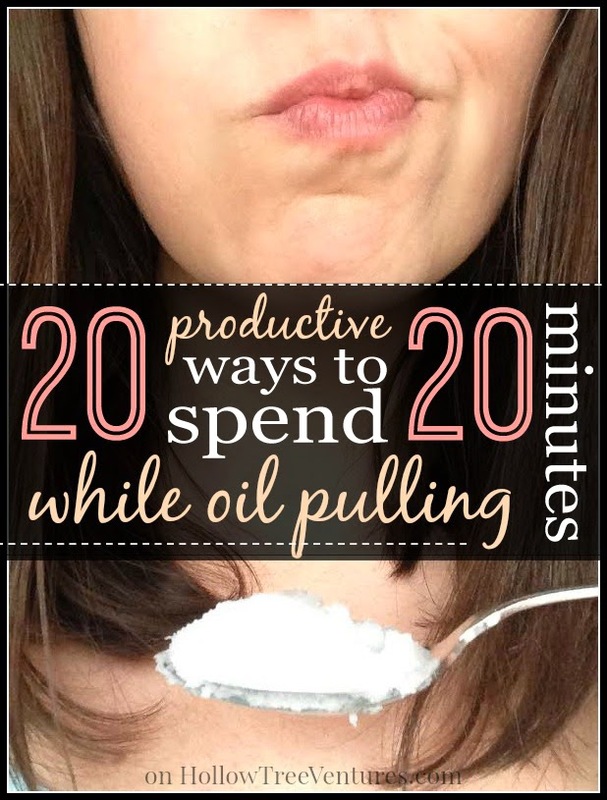 Decide that oil pulling is the best. thing. ever. And this is why people keep doing it. Sure, it's kinda nasty. Sure, it makes you dry heave. Sure, it makes you wish the coconut would go extinct. But even though people say their headaches go away and their teeth are whiter and after a few weeks their urges to light their jar of coconut oil on fire and hurl it into the street while gagging into the kitchen sink subside, we know the real reason people keep it up.